Cucumber, Lemon & Mint-infused water. 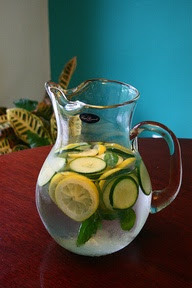 I did this last weekend; I put lemons, limes, & cucumbers in the pitcher; I could not keep it filled up! It was a hit and delicious. Variations can be made to suits fresh herbs as well or any fruit slices etc.